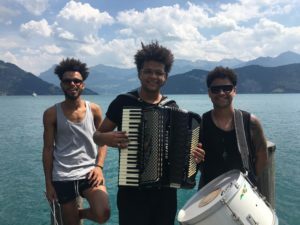 In the beginning of June Fabiano Santana, Vadinho Agotado, Chiquinho Alves, Cacai Nunes, Scurinho Zabumbada, Zezinho Mensageiros, Cassio Sá and Beto Argôlo came together at the Italia Roots Festival in the south of Italy and wrote the following song. The song was then included in the June Programme of Forrózin no ar and three weeks later this recording was made at the 3° Forró ao Pé da Serra in Weggis 2017. The crowd was already singing! gibts davon einen Text oder eine Übersetzung?